In the energy efficiency industry however, we’ve been particularly interested in how smart homes have given way to a significant rise in monetary, energy, and carbon savings. Smart thermostats are probably the best example of this, with ample opportunity to save energy on heating and cooling. A study done by Energy Hub, for example, found that in homes in Michigan, for every one degree you turn your thermostat down you save around three percent of your heating and cooling costs. The US Department of Energy posits that turning your thermostat down between 7-10 degrees for eight hours a day (just a night’s sleep!) saves a consumer roughly 10 percent a year on heating and cooling. For these reasons, the ability to control your thermostat with the touch of a button while away from home can be particularly appealing to people looking to save money, and reduce their carbon footprint. With the mounting pressure climate change is putting on the energy industry, the field of energy efficiency isn’t going to stagnate anytime soon. As the Red Queen so enigmatically says to Alice in Alice in Wonderland “My dear, here we must run as fast as we can just to stay in the same place”. Whenever the opportunity arises to look for new, innovative ways to learn about energy savings we should be aggressively pursuing them to ensure we don’t fall behind in the race to create a more energy efficient, and sustainable society. Recently, one of the top sellers of smart thermostats, new NEEP Ally ecobee, started a “Donate your data campaign” with the goals of finding out what thermostat data can reveal, and to facilitate collaboration between companies in order to create more sustainable homes and communities. 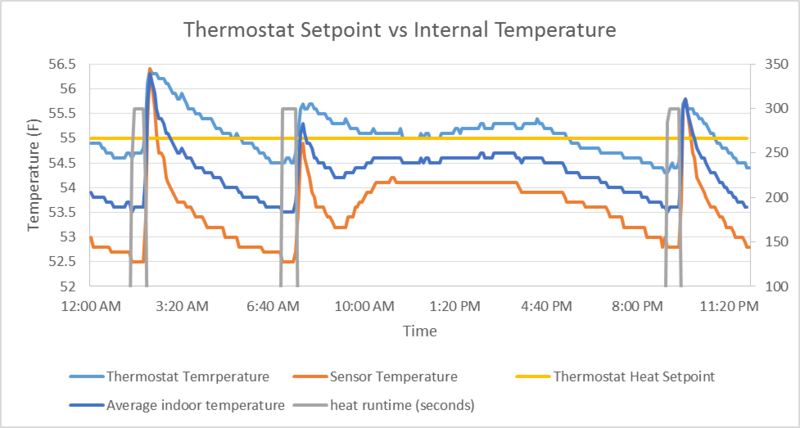 At NEEP, we were lucky enough to get a look into the data, and to dig into just what exactly we can learn from our thermostats. This graph shows the internal temperature taken by sensors around a house throughout the course of a day. The downward slope immediately after the heat stops running is the rate at which the house cools due to the cooler outside temperature. Conversely, the rate at which the house heats is the sharp spike while the heat is running. By comparing these data across homes of varying size in varying temperatures we can establish a benchmark of what is an acceptable heat loss rate. This information effectively equates to how “leaky” a home is; or how quickly it loses temperature to the outdoors. In essence, it indicates how well a home is performing. This information could tell consumers if further investment in things such as insulation could help them save money by improving home performance. With this data, and an understanding of how quickly a house should be heating and cooling, further extrapolations could be made to predict home efficiency solely based off of home size and environment. This is information that would tell home buyers roughly how much energy, and how much money, it’s going to cost them to heat their house over the course of a year. As noted, these data have the potential to tell us how size affects heating and cooling in a house. Theoretically, the bigger the house, the more time and energy it will take to heat. This information could also tell us how quickly a house cools per one degree Fahrenheit difference between internal temperature and external temperature. This could be used to analyze how climate affects thermostat efficiency, and could be used in future models to determine the best way to heat homes in different climates. Finally, rate of heating could be compared to house age, which would tell us how homes from different years, built with different building codes, compare to each other in terms of efficiency. This could be crucial in identifying aspects of homes that create leakiness and poor heat retention performance. It could also help homeowners evaluate how their temperature settings affect home heating based on external temperature, and help them determine the best temperature at which to set their thermostat, in order to achieve their own personal energy saving, and monetary saving goals. Lastly, these data, if compared to other thermostat data, could be used to compare the efficiency of different thermostats. This could become a selling point for companies in that it would allow them to give consumers information about how well their thermostat works compared to others. Not only would this be good for the consumer, but if this information was standardized to allow for comparison between products, it would incentivize companies to make their product better. In a way, this is actually already happening. In 2014, the Environmental Protection Agency (EPA) started a Connected Thermostats Program that compares thermostats to a set of baseline thermostat efficiency assumptions, and certifies them as ENERGY STAR if they meet the criteria. This is great for the consumer, who is now presumably getting a more efficient product and saving money, and good for the environment, which would experience less greenhouse gas emissions due to companies making their products more eco-friendly. At NEEP we are very encouraged by ecobee’s initiative in taking its commitment to sustainability a step further. This campaign has given us the opportunity to look at data that isn’t made public to most companies or people. We believe there is a great potential for this type of data to create a database of acceptable thermostat, and home management, practices. These data could all be scaled to home size, age, and region in order to give individuals personalized information on what to expect from their home and their thermostat. Thermostat data analysis has the opportunity to provide information that could educate consumers on their energy use. Considering the Northeast region, home heating and cooling is a particularly hot (and cool) topic, and because of this, further research into thermostat data has the opportunity to teach us a lot about how to reduce our carbon emissions, and work towards our goal of a more energy efficient future. ecobee, a member of our Allies program, was mentioned in this article. You can find more information about their work with smart thermostats here. To become a NEEP Ally, visit our Allies page or contact Lucie Carriou.